Venus shines at it brightest throughout the first week of December 2010. However, tomorrow is a special day for earthly observations of Venus. It is the day on which Venus reaches what astronomers call its greatest illuminated extent. It happens on Saturday, December 4, 2010 at 4 a.m. Central Standard Time (10 Universal Time). This event marks the moment when the visible fraction of Venus’ day side – the part we on Earth can see – covers the greatest area of our sky. What does it mean? Only that Venus is bright – exceedingly bright in our predawn sky now. If you look, you will find the planet looming low in the east, eerily bright before sunrise. At such times – when the disk is large, because Venus is nearby – we see Venus show phases, like a little crescent moon. 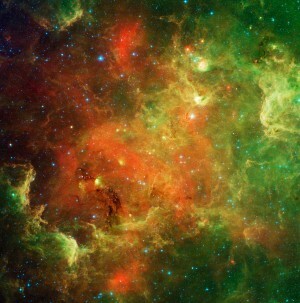 Imagine if we could see the whole day side when Venus was closest – wow! Venus would be bright indeed. However, you cannot see that. Instead, when Venus passes between us and the sun, its day side is facing away from us. That is why Venus is always brightest when the planet is in a crescent phase – just before and after its passage between us and the sun – when the size of the disk in our sky is still large, but some significant fraction of the day side is showing. There you have it. Greatest illuminated extent. It is the combination of big disk side for Venus and fraction of Venus’ day side visible to us. Although Venus’ disk will be less than 27% illuminated by sunlight tomorrow morning, Venus’ illuminated portion will cover more square area on the sky’s dome than at a fuller or thinner phase. After tomorrow, Venus’ phase will actually increase – like a waxing moon. But the faster, smaller orbit of Venus will carry it farther ahead of Earth. We will see the overall disk of Venus shrink as its distance from us increases. Venus will dim somewhat as the morning “star,” but this dazzling world – as always – will continue to shine as the third most brilliant heavenly body, after the sun and moon. 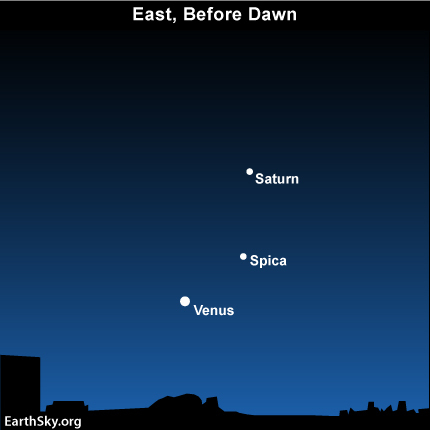 If you are up before dawn, look for the planet Saturn and the star Spica above Venus. Though both orbs display first-magnitude brightness, Venus outshines either body by over a hundredfold. In the dark hour before dawn, you might even see Venus casting a shadow over the December terrain. Site contents copyright © 2019 Recorder Online	except as noted. All rights reserved. | 83 queries in 1.076 seconds.